What percentage of your student body is in music department classes? An elementary school teacher might say 99%. A high school teacher might say 20-30%. Why the disparity? Most band, choir or orchestra teachers will point out that their programs (the main music classes in high school) start with a large amount of students and gradually show attrition through the HS senior year. There are many well researched and established reasons for this attrition, but does your school have a way to address the students who are not involved in performing ensembles? I heard you. You in the back. You said, “We have a music history class…” That’s not what I’m talking about. I’m talking about a class the other 80% of the students really want to take, that’s incredibly relevant compared to the traditional non-performance option. A full-fledged Music Technology class can be the answer. Many schools are adding this new kind of class with amazing results. A Music Tech class isn’t a high-tech theory or history class. Many teachers use it to teach the conventions behind pop music, how recording studios work, how to create electronic dance music, and how to write songs using MIDI keyboards and state-of-the-art editing software. These programs function like art classes, where learning is project-based and students can create projects that cater to their personal interests. Students come out of the class with a great portfolio filled with music created by them. It’s a whole new way of teaching music in the secondary levels. Here’s an interesting exercise. Make a graph with “Quick to master” on the X axis and “Easy to learn” on the Y axis. * Choir gets a higher “easy to learn” score due to data that demonstrates continuity is not quite as important in choir, with the possible exception of some boys who do not handle a voice change well. * History and Theory can be completed in a shorter amount of time – usually a year or maybe a semester. 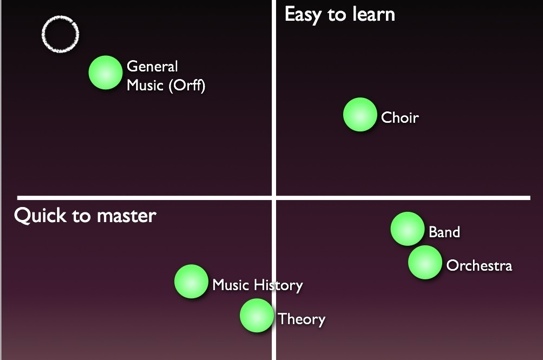 However, the students who succeed are usually highly motivated musicians, and not the average non-music student. * General Music (Orff-style specifically) is the only course commonly offered in the category best suited for a mass audience. Incidentally, most schools don’t offer this past elementary school as it becomes less age appropriate over time. So what does a High School Music Department offer that can be learned quickly and can be a satisfying experience for even the least experienced non-musician? Do other departments offer courses like this? YES! Imagine high school without the fun electives like Psychology, Nutrition, Theatre, Debate, Autocad, Drawing, Ceramics, TV studio and other classes that are highly satisfying experiences that don’t require a supreme dedication on the part of the student! Music Tech can and does fill this gap quite well. Teaching Music Tech has totally changed my viewpoint about what it means to teach music. As a Jr. High band director, the ultimate goal was always to teach kids how to perfectly interpret music that was written by someone else. In Music Tech, the goal is for a student to perfectly express oneself through music they create. A friend of mine compared it to Art class again, and how most artists would study via copying the great masters. Now Art is a personal, creative class with a focus on various techniques of expression. This is a perfect analog to how a Music Tech class functions.